Mix all the ingredients & whisk through. I Used canned mango pulp.If in season fresh mango can be used & its fresh pulp gives much better output & the authentic fresh flavour of mango. Looks good! Like you said the fresh ones make a difference! wooooooooooooow yummmy nice color priya na ice cream sappida varata? Looks yummy. I made a similar one with raspberries and mango few days back. Easy ice cream recipe, the weather is quiet improving here, I should try later! Did you start getting ripe mangoes? Slurrp! ice cream looks coool! Looks real yummy. My favourite fruit, alphanso mango. Wow that's easy and looks wonderful. Wow,yummy! Looks great and colour is vibrant! 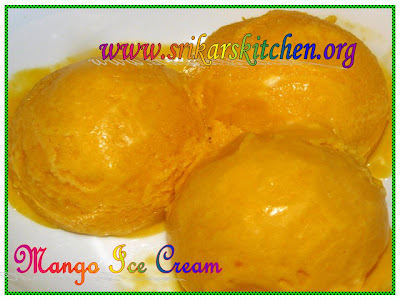 My god, mango icecream look delicious, would love to have rit now Sri, even am not feeling good, tempting scoops!! Wow this is so easy to make..Mangoes have flooded the market here..I should give this a try soon :) Thanks for the recipe ! Now that mangoes in the market and the recipe is so simple...i'll surely can try this one. The mango ice cream looks awesome, such a lovely color ! Very very inviting Sri! Ivlo easy to prepare a! Wow will surely try this and let u know how it goes. Hummmm my fav mango ice cream, delicious entry!!! I love mangoes and this is really delicious..! Looks great too! i have recently become a fan of mango icecream...yours looks so good!! Anything with mango, i love it! Looks gr8! Enjoy! Who does'nt like mango icecream ?? yum looks delicious. I'm sure fresh mango really makes a difference. Hi Sri... thanks for stopping by my blog... really appreciate your comments! Love your wonderful space! :) Will visit often. yummy dessert.. who wouldn't love this? looks great. wow u have some awesome dishes...................and this one is just mouth watering!!! As I had mentioned earlier, am here with my feedback:) I tried ur mango ice cream and it came so well!!! I have posted the Mango Ice cream in my blog.